One recurring theme (of a couple) that I revisit with my work for Every Day Original is that of illustrating music. Music has always been very important to me, since I was a kid in the early 80s, listening to AM stations on a small handheld transistor radio. This led straight into the high school retreat-to-your-bedroom scenario where I spent long hours listening to music after school and drawing or painting instead of doing homework or being social with my peers. Through college, music was my best friend, keeping me going and inspired through very, very long nights working on my art school homework assignments, and the long drives back and forth to school each day. After college, I even gave a turn to playing and recording with a band while trying to hold together my illustration career (that didn’t go so great). While music probably factors less into my life as it did in earlier decades, certainly it is still my favorite form of art outside of painting. So, it’s a medium I enjoy marrying to my visual art from time to time. When choosing to create art born of music, I tend to prefer songs with moods and/or lyrics that are mysterious or dreamlike, that lend themselves to the sort of Imaginative Realism that I prefer in my personal work. When I ran across the track “White Owl” by Josh Garrels in December, I was immediately struck by it. I came across it one night while working. I had playing in the background the Game Awards webcast, which was at least 50% trailers for upcoming video games. One trailer had the intro music of this song running behind it. Within seconds my ears pricked up and I rushed to grab my phone to identify it via the Shazam app. From there, straight to YouTube to hear the whole track, including the lyrics. I probably listened to it nonstop the rest of the evening, and it dug itself into my subconscious so that when it was time for my EDO calendar date, there was almost nothing else to do but to create art based on it. 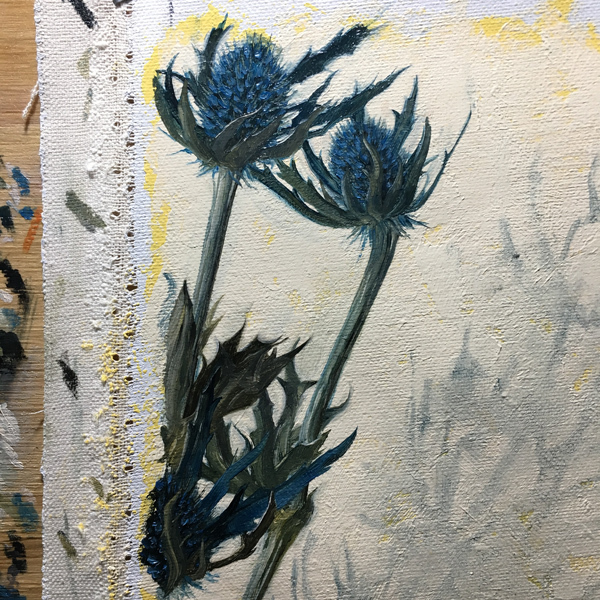 I began in acrylic paint, as I often do to quickly block in colors before moving to oils, which I tend to prefer for its smoothness and open drying time, allowing me to push the paint around freely. I worked in acrylic almost exclusively until 1998, when I switched to oil or oil over acrylic. From time to time, working on the underpainting, I ask myself how far I can take it—can I take it all the way to finish? Why not? But eventually frustration with the medium forces me to move over. This time, however, as I had made significant progress on the piece and had some extra time, I stopped and wondered if I couldn’t try using that extra time to continue on, to tighten the piece up in acrylic and actually finish it. I could always switch if it wasn’t working. So I let myself go—something which happens a lot with these EDO experimentations. And in the end, I had my first (I think) finished acrylic painting of this millennium. What was interesting is that in 1998 when I ditched acrylic, I had from high school, through art school, and into my first professional years developed a very particular method of working with the medium, which I relied on. Having now spent over 20 years primarily in oils, I found that I used the acrylic very differently. I probably couldn’t even have painted it using my old methods if I’d tried. In essence, a prior way in which I created art has been lost, even to me. It’s a strange feeling. I mean I guess I could technically try to do things the same way, but they’d feel very foreign now and I’d be very dissatisfied with it as a method of working. I wouldn’t even want to try. Is that what happens to musicians, too? We all know artists whose early music had a certain quality that, many albums later, is no longer present. Sometimes that annoys me, in that I may not appreciate what they develop into, and I wonder—don’t they have that earlier spirit still in them? Could it be that in the creative life of trying new things, song after song, they lose touch with old methods, old sounds, to the point where years later they almost don’t know how they ended up where they did, either? Typically, an Art Director will ask you to paint things in line with work you’ve shown. 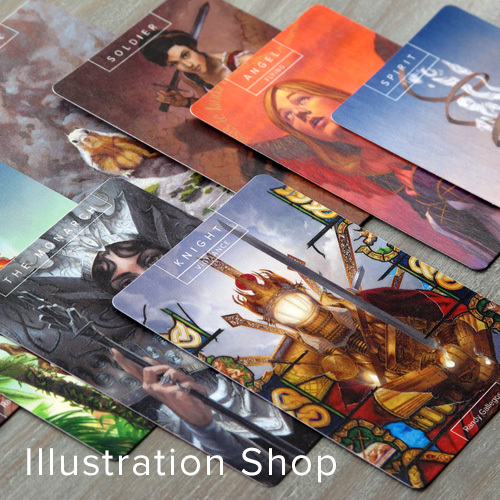 Magic: the Gathering however assigns hundreds of illustrations a year, with visuals that define entire worlds. And that means there will be some things that need illustrating, which might be hard to find in artists’ portfolios. Like old books. It’s also possible you are THE Old Book Artist, with a portfolio of paintings of old, tattered tomes. You’ve been sending it out to art directors the world over but they never had an assignment for you, and if they did it might’ve been years after getting your samples so they forgot to call you. But, as an artist working in the genre of fantastic art, you have to be ready to paint anything. Key to this piece was a really old heirloom book my wife owns, from Ecuador. Its spine is tattered and torn as seen in this painting, and I would not have been able to make that up without seeing it. 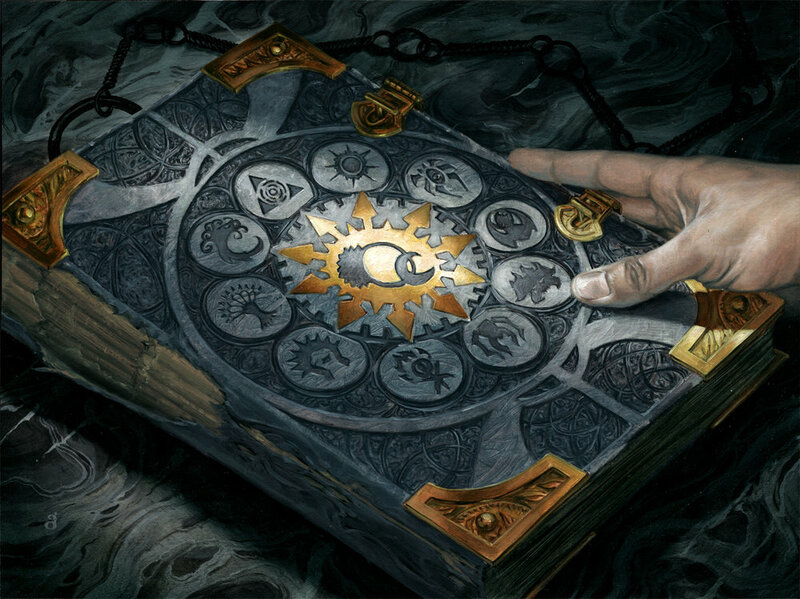 There was the desire on the part of Art Director Cynthia Sheppard that the book not be your standard brown leather, which was fine: this eschewing of standard visuals is typical of Magic. In preparation for the painting, I worked up a more detailed than usual study in acrylic and pencil. Typically I might only render out the main figure(s) or some environmental detail I want to get right before moving to paint. As you can see in comparison to the final, I didn’t bother with the marbling on the counter/table surface at this stage, but otherwise the piece is all there. Were I a digital artist, this would have been sufficient to start and then digitally color. Me, working on the final painting, possibly at a point where I was not impressed, based on my expression. The final is a bit smaller than usual, but scaled large enough to let achieve the details I want, without being larger-than-life, which is always tricky to paint and can be awkward to look at in person. I took it with me to my annual painting retreat in Pennsylvania last winter and painted the bulk of it there, alongside other Magic artists such as Dave and Anthony Palumbo, Winona Nelson, and Allen Wiliams (pictured behind me). I began it in acrylic and quite a lot of what shows in the final is acrylic. 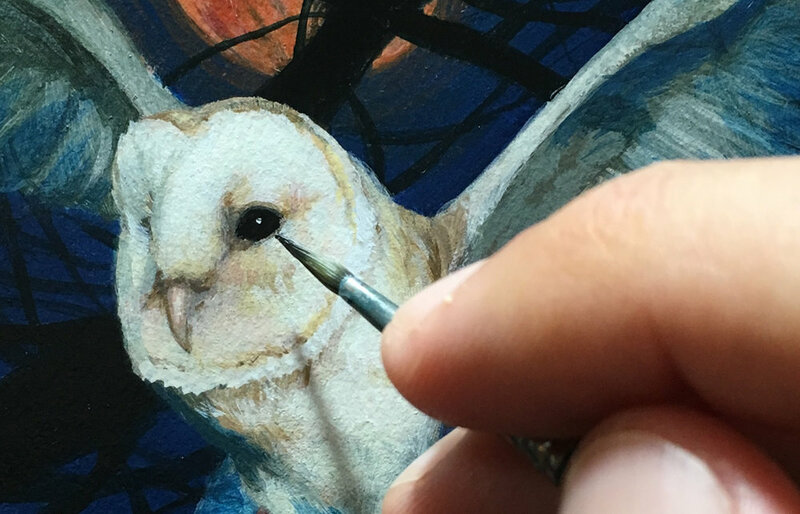 When I returned home, I switched to oils and rendered out the hand and other details, softening areas and doing more of what is difficult to achieve in acrylic. Thankfully, this one was printed on a decently playable card, and as such is attracted more attention than usual resulting in the painting and sketch making their way into collections in record time. 2018 was busy, of the sort where you wonder in prior years if things can get more busy, and then they do. But this was largely a good thing. I somehow managed to spend more time out of the studio, attending and selling at events, even going on vacation for my 20th wedding anniversary, and yet I upped my painting output. And looking back, I’m a little astounded that I managed it. When you buy canvas on large rolls, one edge often is unfinished, this is a piece that came off that side of the roll. Uncharacteristically, I came back in at the end to work out more of the background gradation. After a particularly hectic November and December, during which I ran late (with permission) on a client commission (something I rarely have to do), I had one last painting to do. I had hoped to take a solid week off at the end of the year, but it was not really to be. Aforementioned wife hoped I could squeeze in a commission for her by way of Christmas present. Since I am horrible at gift-giving, this was in a sense a welcome request. 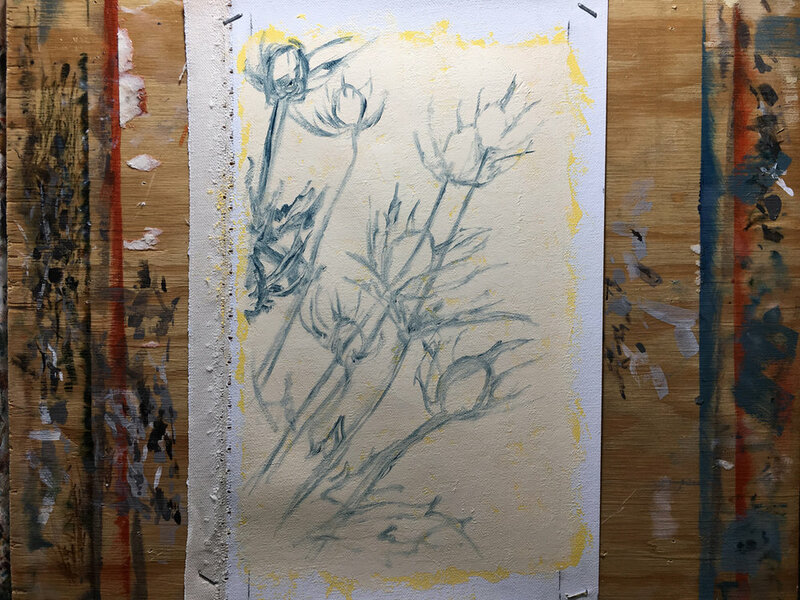 So I ate into my vacation to do a still life of thistles, which she particularly wanted. But since she is my wife, who I love and all that, it was worth doing. And so, due to aforementioned hectic autumn, my Christmas gift was a couple of days late. Wife was completely understanding, part of why she’s great. It also rounded out my year as the last thing finished on the easel. I’m itching to get going on 2019, as it’ll be busy in the kind of way where I wondered in 2018 if things can get more busy, and then they are about to. I hope your year was good, and I also hope 2019 surpasses it. Life is good. Growing up, I had an Atari 2600 as my first home console (not counting a Radio Shack Pong clone). When the next-gen systems started appearing, I went with ColecoVision. So I never owned an Intellivision, which launched remarkably earlier than I remember. I did know someone who owned one, an adult--a married adult! I was young and games were new--I saw plenty of adults playing at the arcade, but never knew an adult who owned his own console. So when he was talking to my dad about how he had bought an Intellivision, "It stands for Intelligent Television," I heard him say with an air of knowledge, having thoroughly imbibed the advertising slogan, I thought he was the coolest adult around. I think in those years I may have played on an Intellivision exactly once. The system also lasted far longer on the market than I remember, undergoing hardware revisions during its ten-year production run. When commencing the art for this hardware, which was pre-commissioned, I had to think about how to portray it. For all of these consoles, I have painted the controllers are separate pieces from the hardware, often creating compositions that hang together. The Intellivision however is one of only a couple of systems where the controllers nest into the hardware, and so portraying the console faithfully would seem to include showing the controllers. Having one or both dangling off via cables into other paintings seemed unattractive. So I decided to make the console painting self-contained, and paint a controller separately. I actually painted the controller first, since the console was pre-commissioned and I needed to test the approach a bit first. I have never worked with metal leaf before. It is a material that seems to have had a significant revival in the past decade or so. When used well it makes a lovely effect in original art, but I have also kind of avoided it because it is simultaneously very tempting to let the leaf do the heavy lifting on a work--since it has such wonderful material properties, it seems like an easy way to create ooh-aah factor on its own, apart from any vision the artist might bring. But as I just said, it can be used well, and I hope this might be one of those times. The system's design includes a sort of fake gold metallic look, to accompany the faux wood. While it would also be quite simple to have just painted it to look realistic, it seemed to me that this was a place where I could use metal leaf directly in those areas, and then paint a bit on top to replicate the sheen. I think it worked well. I also let little slivers of leaf poke through the background--since one of the benefits of leaf is the way it constantly changes appearance depending on the ambient light, I thought this might be an occasion to let a little of the material's natural wow factor to shine through, so to speak. In the end it was a fun experiment, and is one I might use in future Hardware paintings when metallic surfaces were employed. Additionally, one of the difficulties I've faced with this series is that even though the handling of the paint has generally been much more painterly than my usual works, people often still think they are photographs at first glance! So finding ways to make a painting read more as a painting while still being accurately representational is important to me, going forward. Lastly, the title here is really meant to be a bit of a joke. While sporting some neat ideas like nested controllers and a side-loading cartridge slot to keep the immediate aesthetic undisturbed, the controllers were among the least-ergonomic ever created. Looked cool, certainly, but ugh. I mentioned I'd only played this maybe once as a kid, but upon getting a system in to paint, I also had some fun with it and confirmed this.